The last few days have been spent lounging about with Jo Plumbe in bays with the rich and famous. On Sunday we left Benirras to journey south with quite a swell and headwind so we ended up motoring. We had two nights booked on a free mooring buoy on an island just north of Formentera called Esplamador in the marine conservation area. When we arrived, there was no official and we couldn’t find our buoy as a lot of rhe numbers had rubbed off and are in no apparent order so we picked up a spare one and settled down for the night. There was not much there apart from clear water and sandy beaches so on Monday Liz went exploring across the bay to Formentera where a large number of super yachts were anchored. The beach was lovely and the waters turquoise but very crowded. Whilst she was away, an irate motor yacht came along side to demand we move as they had booked the buoy we were on. I explained that we didn’t know where ours was and couldn’t they just pick up another one as appears to be the practice. Apparently, that would have given the woman a heart attack as she kept waving her reservation at me and shouting “It’s the law – you must move”. We waited until an official appeared who told us where our buoy was and got the boat who was on it to move. All executed without any drama but you would have thought we had committed a heinous crime from the attitude of the woman on the other boat. By this time Liz has appeared (after all the hard work had been done!) 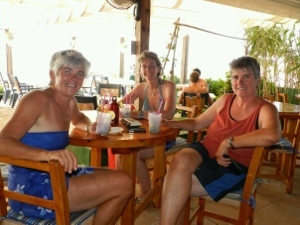 so we went back to the beach to sample the beach bars. When we arrived back, the motor boat had gone so god only knows why they were making all that fuss for a few hours stop. 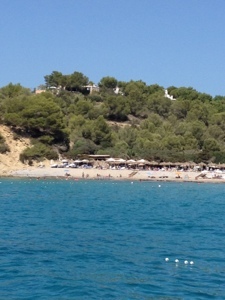 The next day we moved over to another trendy beach on Ibiza called Cala Jondal which is more select than Formentera. The restaurants there run a dinghy service to the super yachts and will even deliver meals! The trendiest place was a bar called the Blue Marlin that was full of fabulous people during the day sipping champagne on queen sized beds on the beach but turned into a seedy nightclub in the evening when the super yachts left for their next destination. The bay itself was gorgeous with more turquoise water and good holding in sand for the anchor. Since we left Gibraltar two weeks ago, we have only been in a marina once and that was because of the propeller problem. We like mooring for free! Sadly, yesterday we said goodbye to Jo Plumbe after a great week together and made our way up the NE coast of Ibiza. We had intended to anchor overnight and then make the crossing to Mallorca on Thursday but we didn’t like the look of the anchorages we saw. They were a bit too exposed to the swell and the wind for our liking so we decided to continue and do a night sail to Palma on Mallorca. It was another 60nm so we figured we would arrive in the morning. We had good wind for the first 4 hours but then the wind died as predicted. There was strong wind forecast for later on Thursday so it also made sense to get there early and try and pick up the buoy we had booked in another marine preservation area in Palma Bay quite close to the airport at Arenal. Pictures below of Esplamador, bar at Formentera, anchorage at Jondal and the Blue Marlin club. 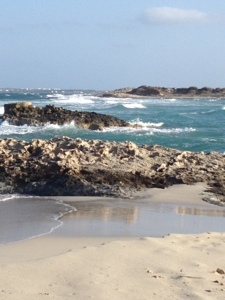 This entry was posted in News and tagged 2012, Balearics, Med, Spain. Bookmark the permalink. All looks wonderful.Bet you are glad you are out of england it has been the wettest summer in 100 years so I am off to Spain on Tuesday cant wait!!! !